In Potsdamer Square you can find this highly-recommended and unique Italian restaurant. 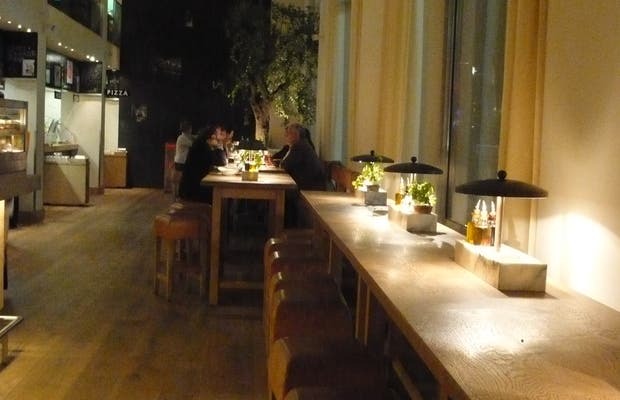 Vapiano specializes in fresh pasta, and what makes it different is the fact that you have all the ingredients to pick from yourself and you can choose how you want the pasta. As you're watching them cook you can even tell the friendly chefs to add more oil or if you want your carbonara sauce with less onion! In addition to fresh pasta they also serve delicious pizzas and salads of all kinds. They also have a wide selection of both white wines and red wines as well at an affordable price. The tables long ones, as in a bar. This is an excellent local Italian fast food restaurant. You give your card at a counter with 8 cooks for each type of pasta ... (salads, pizzas, pasta, desserts ...) all beautifully decorated and unbeatable prices ... about 13 € / p q truth worth fastrestaurant taste this!